What does it mean to be chivalrous? The concept of Chivalry today has been stripped of its most sublime traits and reduced to the idea that one should open the door for a lady, which is certainly a part of it, but by no means complete. Chivalry is a serious and manly striving for self-discipline and spiritual perfection that can best be summed up in four words: "Death rather than dishonor." From June 29 to July 5, Catholic boys and dads learned what it means to be chivalrous and how they can apply it to their everyday lives in the 2018 Call to Chivalry Camp in Louisiana. Here is the day-by-day report shared with parents over the course of the camp. This morning, we decorated the premises of the Feliciana Retreat Center in a way that evokes the Catholic Orders of Chivalry and the English theme of this year’s camp. We also enthroned a statue of Our Lady of Walsingham in the main room so that She can preside over all the activities of the camp. Once everyone had arrived, the official opening of the camp began with the Salve Regina and the crowing of a statue of Our Lady of Fatima. Mr. Elias Bartel welcomed the participants and explained how the camp works, emphasizing the high standard of discipline and the spirit of Chivalry that makes this camp tick. Following his remarks was a presentation by Mr. Evan Olwell on the Ten Commandments of Chivalry. This Code of Chivalry, formed over centuries, was best embodied by Emperor Charlemagne, the father of Christian Civilization in Europe. We have a great group of boys, dads and TFP staff -- about 55 in all. The conversation is excellent, especially at meals, and the boys are in very good spirits. At dusk the boys got ready for Prison Break, one of their favorite games. How does it work? Well, a group of boys with flashlights (guards) go looking for boys hiding in the woods without flashlights (prisoners). Those who get tagged need to go to "prison" where they can only go free when a fellow prisoner successfully evades the guards and makes it to the prison to tag those waiting for freedom. Reveille was at 6:15 AM. The musical trio of bagpipes, snare drum and bass drum are much more effective than any digital alarm clock. And it is nearly impossible to slumber again after hearing the martial tune echo down the hallway. Then the boys line up in the hallway at attention. The leader for each wing of the building leads the boys in the first prayer of the day, the St. Michael Prayer. At 7:00 AM, the rooms were inspected for neatness and cleanliness. Those who failed the inspection did 5 pushups. After verifying that all the beds were made correctly and personal belongings were in their proper places, the boys went to the dining hall for breakfast -- scrambled eggs, sausage, pancakes, cereal, juice, and coffee. The weather today is hot, but manageable. The boys are taking turns climbing the 35-foot rock wall on the property with harnesses and climbing gear. It is a challenging ascent that demands strong arms, a firm grip and excellent coordination. Those who successfully reach the top of the wall are rewarded with a fast ride down the zip line, which runs through a forest of tall pine trees. There was a talk about the Medieval Order. Some of the principles of the Middle Ages that were discussed included proportionality, regionalism, law, sacrality, and the monarchical principle. The often misunderstood role of the clergy, nobility and the people, and the harmony between the Christian State and the Church as well as their shared mission to lead souls to Heaven were explained. Today is the Feast of the Most Precious Blood of Jesus. After breakfast, we jumped into our vehicles -- a long caravan of many vans -- and drove to St. Agnes in Baton Rouge to attend the Holy Sacrifice of the Mass in Latin. Boys naturally have a lot of energy, so after returning from Mass, they rushed outdoors to play a spirited round of shield-ball, French football, and dodge ball. In afternoon, we learned about King Henry V and his role in the famous Battle of Agincourt, immortalized in William Shakespeare's play. We also watched video excerpts of the Trooping the Color ceremony, highlighting the splendor and pageantry still found in British military ceremonial. This set the tone for what would come next: a formal English dinner to fit the theme of the camp. Fare included leeks, "medieval hamburgers” (beef, port and bacon), English pastries, and a traditional English cake. The dining room was decorated for the culinary event with flags, a small shrine with a statue of Our Lady of Walsingham, and medieval armor. Beautiful music played in the background and the tables also had tablecloths. These small details elevated the ambience and contributed greatly to make the meal special. After the routine wake up drill, morning prayer, inspection, raising of the flags and breakfast, we listening to a most interesting presentation delivered by Mr. Ted Huerena, headmaster of St. Louis de Montfort Academy. The talk, “The Story of an English Village”, was an engaging visual tour covering the history of a typical English village from the thirteenth century, all the way to the modern era. The crux of the story demonstrated how a deep process took place in society whereby the Cross of Christ, which were once physically and spiritually at the center of life in the English village, was gradually put aside and attacked by the Protestant Revolution. Later, the Industrial Revolution, with its mania for speed and production took over and upset the pace of life proper to an organic Christian society, greatly destabilizing the life of the family. The boys participated in the presentation, contributing to the analysis with their own questions and comments. The boys competed in archery and also had a fencing class with Mr. Elias Bartel. Many of them are talented archers. We'll see who takes 1st place. After lunch, we enjoyed a talk about the life and martyrdom of St. Thomas More. We also learned about St. John Fisher who was the only bishop to remain faithful to the Papacy when King Henry VIII broke with Rome. In the afternoon, the boys went for a swim. There's a floating trampoline in the pond and they took turns jumping off the dock and swimming out to it. On the floating platform, they played various forms of king of the mountain. The last man standing was the winner. Losers got tossed overboard. After dinner and rosary, we heard a report about the campaigns of TFP Student Action given by Mr. John Paul Tomba and Mr. Matthew Miller. The boys and dads enjoyed seeing videos of debates and street campaigns for moral values. The most important activity of the day followed: The all-night Vigil of Arms in the presence of a relic of the True Cross. We formally started the vigil with a beautiful ceremony in which each boy solemnly approached the relic to venerate it as TFP volunteers sang Gregorian chant. On the altar is also a relic of St. Simon Stock. Throughout the night, the boys will take turns praying before the relics, imploring God, through the intercession of Mary Most Holy, to assist His Church at a time of such great need and to also bless America with graces of conversion, so that like a new Saint Paul we might as a nation become what we were called to be -- a loudspeaker of truth and virtue. "I never ran so much in my life!" That's what one of the boys said after the grueling Treasure Hunt that sent two teams crisscrossing the 219-acre property to discover where the treasure was hidden. A heavy downpour of rain did not stop or even slow down the teams. Their captains displayed true leadership during the three-hour ordeal. Despite being drenched and exhausted, both teams continued pushing on, overcoming many challenges and obstacles along the way. One such challenge was a clue written in code. Deciphering it literally took the skill of a Sherlock Holmes. We now have a winner for the chess tournament, a 12-year-old boy. The young lad was able to win against much older boys and took 1st place. Well done. The main talk of the day covered a vast topic: The Three Revolutions. In a nutshell, it explained the historic process undermining the Church and Christian Civilization, originally developed by Prof. Plinio Correa de Oliveira in his book, Revolution and Counterrevolution. There is a common thread that can be traced starting with the fall of the Middle Ages all the way to our present time in which we see public manifestations of Satanism. Happy and Blessed Independence Day! Before breakfast we held a solemn raising of the American flag. The flag was carried to the formation quad as our drum, brass, and bagpipe corps played America the Beautiful followed by the National Anthem. We then sung the Nicene Creed -- pledging our fidelity to the One, Holy, Catholic and Apostolic Church -- and marched to breakfast singing God Bless America. The simple yet solemn ceremony was uplifting and helped us reflect on the significance of the day. The first talk of the day was given by Mr. Gregory Oehl about the importance of ceremonial and etiquette. From footage of Queen Elizabeth II's coronation ceremony to the traditions of the US Marine Corps, from a formal table setting to a musical composition by Handel, we analyzed how ceremonial and etiquette are not just unnecessary fluff, but rather an expression of the love of God. The boys played field games and returned for a special 4th of July barbecue put together by the Dads. It was delicious. A priest arrived to hear Confessions and celebrate the Holy Sacrifice of the Mass. Then everyone set off to Baton Rouge to watch fireworks from the USS Kidd, a naval vessel moored on the bank of the Mississippi River. Our convoy parked near the levee and we assembled to march to the ship. The boys wore their medieval scapulars emblazoned with a large heraldic symbol on their chest. Leading at the front was a large 21-foot American flag, a TFP standard, a small marching band, the boys in marching order, and the dads who took up the rear. We all marched in step to the sound of God Bless America and other patriotic hymns. Some of the spectators on the levee applauded or snapped pictures with their phones. Already on the ship, as we waited for the show to start, a light breeze picked up. Suddenly, boom! the dark sky lit up. The setting was perfect. The water reflected the fireworks. And all you could hear from the boys were "Oohs!" and "Aahs!" Their excitement was well founded because the show was spectacular, especially the grand finale, with an array of colors and explosions. Today is the final day. This morning, Mr. Elias Bartel gave a closing talk to the boys, recapping what they had learned throughout the camp and encouraging them to persevere in being chivalrous in an unchivalrous world. We had lunch and then picked teams for Medieval Games, the red team choosing St. Ferdinand as their patron, while the blue team picked St. Thomas Aquinas as theirs. The heat was as intense as the games: Dodge ball, French football, shield ball, steal the bacon, sword-fights, and tug-o-war. The climax was an exciting obstacle course, which included a section where the participants had to “army crawl” across an open field while dodging water balloons launched from a distance. After Holy Mass, we held a final Rosary procession together with all the families who came. In the meantime, the fathers were busy putting the finishing touches on the cochon du lait (suckling pig). The procession took us to the hall, which was now decorated with colorful flags and shields. The dads carried the cochon du lait in to the sound of much applause. We also feasted on Caesar salad, chicken, and watermelon, all superbly prepared and served. The ladies were not outdone, however. 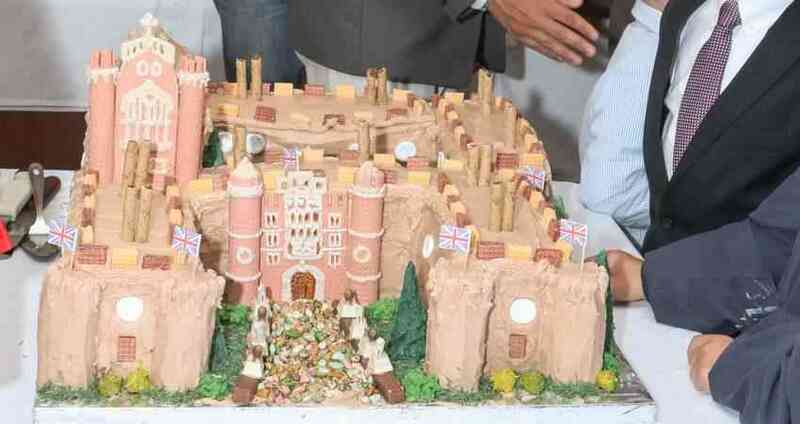 They put the cherry on top with a splendid castle cake that resembled Hampton Court (a royal palace in London). The 2018 Call to Chivalry Camp closed with a final prayer and blessing. Please pray for all the boys who attended the camp. Pray that Our Blessed Mother fill them with special graces and inspire them to be great men, men who are willing to do great things for the greater glory of Our Lord Jesus Christ and His Holy Church.